Today we’d like to introduce you to Daniel Broniatowski. I was born in Cleveland, Ohio, and started taking piano lessons with my mom at the age of 4. By the time I was 6, my dad enrolled me at the Cleveland Institute of Music to take violin lessons in their Suzuki Method program. I was hooked from a young age. I always felt that music had this amazing power to move people in a very elemental way that does not need words and a desire to share this language with others is what continues to drive me to this day. Music is the great unifier – it bridges cultures and people from all backgrounds and everyone can understand it and make it. By the time I was a teenager, I knew that this is what I wanted to do with my life and I started to take the violin more seriously – practicing 3-4 hours per day. In addition to my teachers in Cleveland, my public high school’s orchestra program and the Cleveland Orchestra Youth Orchestra played an enormous role in the shaping of my musical character and personality development. I realized that there were so many other talented individuals who shared my passion for making music together and the power of playing in an ensemble had an unbelievable effect on me. At the age of 17, I was accepted into the New England Conservatory of Music, where I studied with the award winning French violinist Michele Auclair, one of Europe’s most famous teachers of the continent’s top violinists. 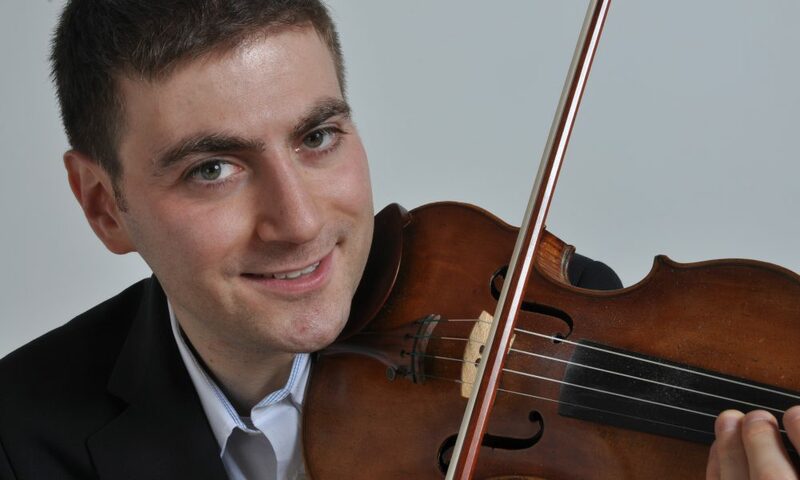 After completing my bachelor’s degree in violin performance, I was accepted into the Royal College of Music’s master of music degree in London where I studied with Itzhak Rashkovsky, a famous Russian pedagogue whose students have had successful concert careers and won major international competitions. Eventually, I would make my way back to Boston in 2005 and I spent the next 3 years studying with Yury Mazurkevich where I was accepted to Boston University on full scholarship for a doctoral degree in musical arts. Mazurkevich, a star violinist who continues to concertize to this day, was a student of the famous Russian-Jewish violinist David Oistrakh. Throughout my studies, I had been teaching since 2003. The passion I had uncovered as a child just HAD to be shared and the more I taught, the more I realized that this was my calling. I founded the Maestro Musicians Academy in 2013. The school was a natural outgrowth of my private teaching studio and since then, we have grown to serve 30 students in Boston in 5 locations with approximately 10 teachers on our faculty list. The Boston suburbs we serve are West Newton, Brookline, and Lexington and their surrounding areas. We also coordinate the after-school music program at the Jewish Community Day School in Watertown. Despite the rosy image that musician’s convey, a career in music is not easy. Classical music, particularly, is an art that is in danger of being forgotten by the general public. Despite my pronouncement, I do not believe that the art form will die, as enough people see the value in it. The difficulty, however, lies in the fact that our general culture and values as a country have somehow minimized the importance of the classics, whether in music, the arts, or literature. As a result, I feel that it is my mission to transmit these values to the next generation. Music has enormous power and influence over young people. What we hear every day in our lives slowly but surely influences our character. While I do not believe that listening to classical music makes you a better person just because you listen to it, I do believe that the art of making and sharing this music can do so. For instance, music lessons teach discipline of the mind and body and sharing music with others teaches communication and harmony – two things we need desperately in today’s world. Incidentally, this applies to other genres of music as well as long as the messages in the music are not degrading. Please tell us about Maestro Musicians Academy. Founded in 2013, the Maestro Musicians Academy specializes in pairing up the perfect teacher with you or your son/daughter. Our Boston Music School has campuses in Brookline, West Newton, and Lexington, MA. In addition to possessing qualifications from the top conservatories and universities in the world, our faculty members are hand-picked for their unique abilities to interact with students tailored to their learning styles and goals. We believe that music is all about communication. Music is a language that touches us on an elemental level and therefore does not need words. One can express the deepest thoughts, feelings, and desires through music and this is what we are passionate about. We love giving our students the tools that they need to communicate the language of music. Music is all about the art of communication. It is a language that is the ultimate mind-body discipline that allows you to be in the present moment. Our teachers empower students to impart deep thoughts and feelings in ways that transcend words. Furthermore, music lessons enable a student to see a project from start to finish. In this day and age of instant-gratification, music instruction is even more necessary, as our children are losing the ability to incorporate the trait of patience into their day to day lives. Learning a complicated piece of music takes time and focus and a good teacher helps build the skills necessary to master the music, one step at a time. Every year we hold two recitals – one in February and one in June. It makes us proud to see our students perform and show our community what they have learned. Our student recitals are a testament to the fact that music lessons instill confidence, promote positive self-expression, and build character. As a child, I would spend many evenings listening to my mother practice the piano. My brother and I used to dance around in the room while she was playing. This is probably my earliest memorable musical influence.